Hydrate with water and/or fluids with some salt in it like coconut water or apple juice. Some people are heavy salt sweaters. Everyone is different and nutrition is complex, and talking about nutrition is akin to religion or politics. It’s not always one size fits all, and even as our own personal health changes, our diet needs changes. So it’s not one size fits all at all times. The world of nutrition research is complicated by people with agendas. I choose for my own health, plants and the associated carbohydrates with whole plants: legumes, grains, potatoes, rice, fruits. I choose blender over juicer for fiber. We all need lots of fiber. B12 is made by anaerobic bacteria. We need B12. All plants have protein even rice. Just a fun fact: 1 calorie of broccoli has more protein than 1 calorie of steak. Yes, athletes need more protein, but they also need for calories. By naturally eating more calories, we will naturally make up for it in protein. We were made to eat plants more so than cats. Cats have protein taste receptors on their tongues but they can’t taste carbohydrates. 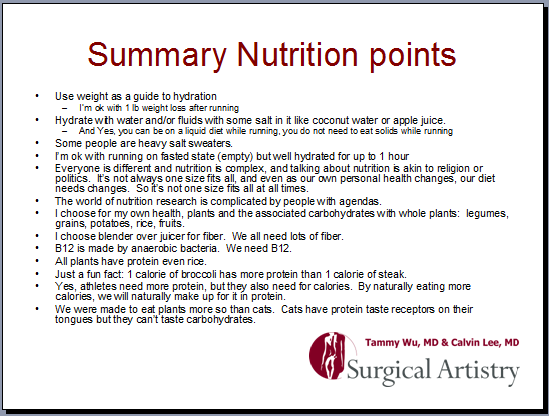 Nutrition lecture for runners was given 2/11/17 at Doctors Hospital in Manteca, California. This entry was posted in Cancer, Education, General Info, Green Living, nutrition and tagged nutrition, runners on February 12, 2017 by Calvin Lee, MD.